I bought the 10” VS TurnCrafter Pro after reading all the reviews I could find. Built and finished a stand for it, read the user manual twice, then set about putting it together. The thin plastic “zip lock sandwich-bag-style” packaging was ripped so I had to hunt for the contents. And with no instructions I had to go by the diagram in the user manual to see for example that a short handle needs to be added to the adjusting wheel on the back of the tailstock. The wiring to the small round keyed connector to the speed control unit is about the only thing that looks sub par. The major problem is at the end you are left with a power cord that comes separately and a matching female connector on the cord connected to the unit. If connected and plugged into a 110v wall socket they destroy part of the lathe even if the unit switch is off and the speed knob turned all the way down in preparation to use the new lathe for the first time. Hidden on the back of the heavy unit when you have it in place are the spots where the lathe pigtail and the separate unit A/C cord need to be plugged in. If you missed that or the unit’s speed indicator comes on but when you turn up the speed control knob the lathe motor doesn’t turn like my experience, then you find what seems to be a courteous company with great reviews that seems to run with a minimal crew. I sent an email note before bed and checked when I got up. No reply. I called tech support (which closes at 2 PM my time, MDT) and the number was transferred to the order desk. They told me that the single tech who handles this problem wasn’t available and put me to his voice mail. I still expect and hope that this will eventually work out well. But if it comes down to a non-working lathe and the end of their 30-day money back guarantee I’m going to be shipping it back to them. As I said, they are very friendly up front, but on my first order I found out you can’t reach them after 3PM my time, 2PM for tech support. That’s 2PM and 1PM respectively for the left coast. 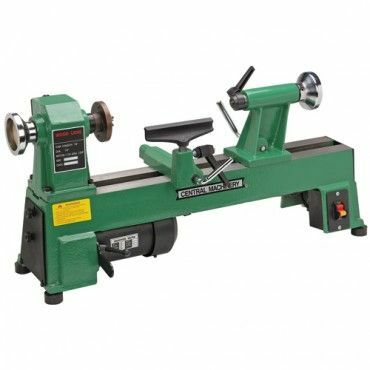 Has anyone else had experience with PSI and the variable speed TurnCrafter lathe? I considered something involving dust collection with PSI, maybe an overhead boom? I couldn’t get the simplest question answered, so I aborted. I’ve bought general turning supplies from them with no troubles, though. I just bought my PSI lathe from Harbor Freight. It is green instead of red, and only cost $149 with coupons, but otherwise, I think it’s the same machine. Well, not the same as the VS machine; mine is the 5 speed version. I did get my bed extension from PSI because HF doesn’t sell it. HF is real simple to deal with. If it won’t work, they give you a new one. I don’t understand how you can rate this tool average when it doesn’t work. I couldn’t give a tool even an average rating if it didn’t work immediately upon setup. Anyone else think a tool that doesn’t work with a non-responsive customer service can be rated average? I looked at Jet, Rikon, HFT, and in comparison I think the PSI lathe with the accessories included is 4-star. I also think that with a minor design fix to the wiring connections, adding a single page of setup instructions to the User Manual, and a bit more quality control since I don’t know that my unit wasn’t defective from the get-go, that the problem I ran into could be solved from here on out. It is a very nice heavy cast iron base with rubber feet, smooth fit-and-finish, and it will be sad if I have to ship it back. That said, I didn’t get a call back so I’ll be trying again tomorrow and every day until I can actually connect with someone at PSI who can help me. And I plan to document it here so that others can benefit from my experience. Hopefully a good experience after it all works out. My thanks to those who have welcomed me as a newbie on this website. To be clear, I am glad you posted your review and hope things do work out for you. I certainly don’t want you to get the wrong impression of me or of this site. So if you thought I was attacking you or took offense to my words I apologize; that was not my intent. I do believe that a tool that does not work should not be rated average until it does so, but that is my personal opinion. I would rate your lathe right now as poor because it doesn’t work. I cannot tell if it is underpowered, if it stalls easily etc. In otherwords, anything about how it performs because I cannot even turn it on. If after it was fixed I was pleased with it and it performed as well as other lathes in its class I would upgrade its rating to average. Thanks to Jack_T. I think a 1-5 rating system is too narrow a range in practice. I wish it were 1-9. And if I could change the rating as experience dictates I might “be with Jack” too and start low based on mine not working although I can’t imagine PSI having so many glowing ratings if my experience wasn’t a “one-off.” So I rated it on features plus a discount for the problem from the top rating most other purchasers seem to have of this lathe. Mine has a 3/4 HP DC motor, although even HP is not a clear-cut issue as some vendors play tricks to get a larger “Max HP” number rather that available hp during continuous use. And I am concerned that amps on the label is blank. It should be fine for a 10” swing as long as speed is set appropriately for the radius being turned. And 3/4 HP is great when compared to a 1/3 HP motor on the VS model at HFT. I rejected that lathe because 12” between centers I think is too short for a lot of what I plan to do, although I’m not quite ready to add the bed extension available at PSI. If I find a project that needs table-leg length turning then I will. But that is another plus in my view—having an easy and inexpensive bed extension add-on available. I hope I don’t have to eat too many of my words as I value the insight the members here provide and over time I hope to become one of the bunch. Rather than a “review” on something that you haven’t even been able to use yet and giving it four stars , why not just go to the forums and ask if others have experienced the same problems ? Now with your high rating in the mix , it will skew the overall review results for this product. I don’t get it either, what would it take to rate it two stars or even 1? I agree on the rating issue, Dusty56. At this point I shouldn’t have rated the product at all. My original intent was to have a thread so others could avoid the spot that I’m now in, and to have more info covering what actually happens with customer support on this than you’ll find in a typical review blurb. And also to get the feedback you suggest and which several have already taken a moment to provide. With what I have read about PSI customer service I felt that they would make it right concerning my problem and that the quality of the product that I can see along with the experience others have had with working versions of this same lathe would make an above average rating more fair than a low rating on a one-off problem in the long run. And I expected that if I was wrong in that expectation then any disappointed actual purchasers of this model lathe would probably sound off. I guess it is customary for the new guy to put his foot right in the proverbial cow pie. I will certainly be thinking about all the replies and do my level best to take it to heart. I have the non-VS turncrafter lathe from PSI and it has been awesome since I’ve owned it… I have definitely put it through it’s paces and it has delivered every time. colour and it has a different on/off switch. I’m guessing these are all cast in the same factory in China. I really like my litte Sheppach so far though. I will do a review later when I’m sure of what it can and cannot do. First thing today I called PSI and spoke to the support tech. He had me unplug the little two-wire round plug from the control box. With that unplugged the lathe runs and VS works but without the display fed by the two-wire connector. He told me it is fine to use it that way, and he is sending me today a replacement LCD with the pigtail like I unplugged, and a little 1” circuit board. For me the test will be whether there is any problem turning with sharp tools at the appropriate speed for the situation involved. And I don’t expect there to be any, (especially considering interpim’s experience—Go Navy! ) but I will begin turning right after a Dr appt this morning, as I have several projects ready to go. I bought PSI’s Barracuda 2 chuck set to go with the four prong drive spur and 4” face-plate which come with the lathe. The live center included for the tailstock seems particularly well made and I picked up a 2MT Jacob’s chuck at HFT. It’s good to hear that your lathe is running now and the new part is on its way. I certainly hope you will be pleased with its performance and you will be able to give it a high rating based on its performance. That type of post would be better placed in the Forums, in the section headed “Woodworking Tools, Hardware and Accessories”. Please let me know what you think of the HF Jacobs chuck after you get a chance to use it. I have seen it and have wondered if it is any good. No eating your words or the cowpie, I heard you can get sick that way. By the way, with regards to becoming one of the “guys”, you already did that when you joined and started posting. Again, welcome.